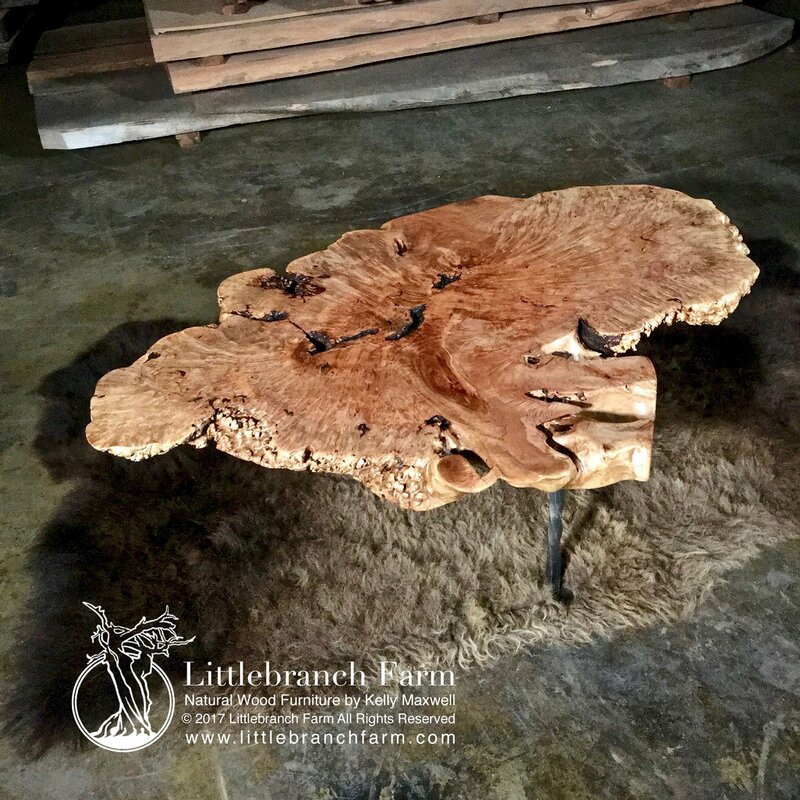 We also design and craft natural wood coffee tables along with rustic coffee table using live edge wood slabs. Our live edge wood slabs are native to the USA. Such as redwood burl, maple burl, and claro walnut. We seek out raw edge wood slabs that are ethically sourced from the forest floor or dead standing trees. By working closely with arborist, loggers and wood mills we are able to select the best natural wood. Many clients ask us about the drying process. We believe drying wood long and slow is the best. The average is one year per inch thickness minimum depending on the wood species. Kiln drying has its place but only after adequate air drying. Also if you wish to kiln dry we suggest a solar kiln. The most important part of picking a rustic coffee table is choosing a custom furniture maker. With the growth of the internet, we suggest asking simple questions? How is your wood slabs or material sourced? With a growing issue of burl theft in the world, you want to buy from trusted sources. We also prefer to only us in our custom furniture material that was harvested from dead standing trees. Another good question is how long have you been in business. Also, how was the wood dried and stored? We believe in air drying over kiln drying. Basically, we believe it boils down to a relationship. 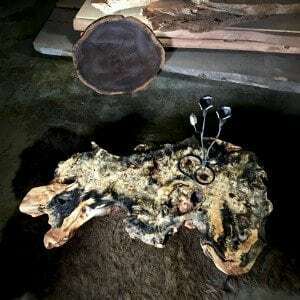 Another redwood driftwood root base supporting a live edge redwood burl wood slab. Each of our natural wood coffee tables is one of a kind and feature the organic movement of the wood. This upscale style custom rustic furniture made famous by George Nakashima and his mid-century furniture designs. Natural wood coffee tables can have a live edge but may also have clean lines or a combination of both. 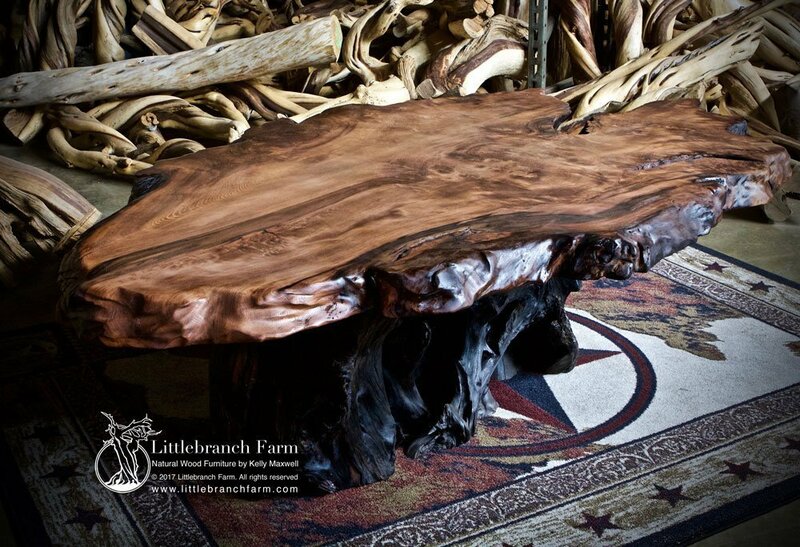 The organic movement of the live edge slab coffee tables combined with a root base is calming to the soul. With the clean line, the natural shape and the wood are the shining moments. Eather way the warmth and stability of real natural wood furniture shine through. This style wood coffee table is also referred to as a rustic coffee table. Driftwood root and stumps are the foundations in our rustic coffee table. These driftwood and stump bases highlight the natural live edge of the wood slab top. The organic movement and grayish brown color tones define the space they reside in. Rustic is a loose term and can sometimes be thought of as raw or unfinished. 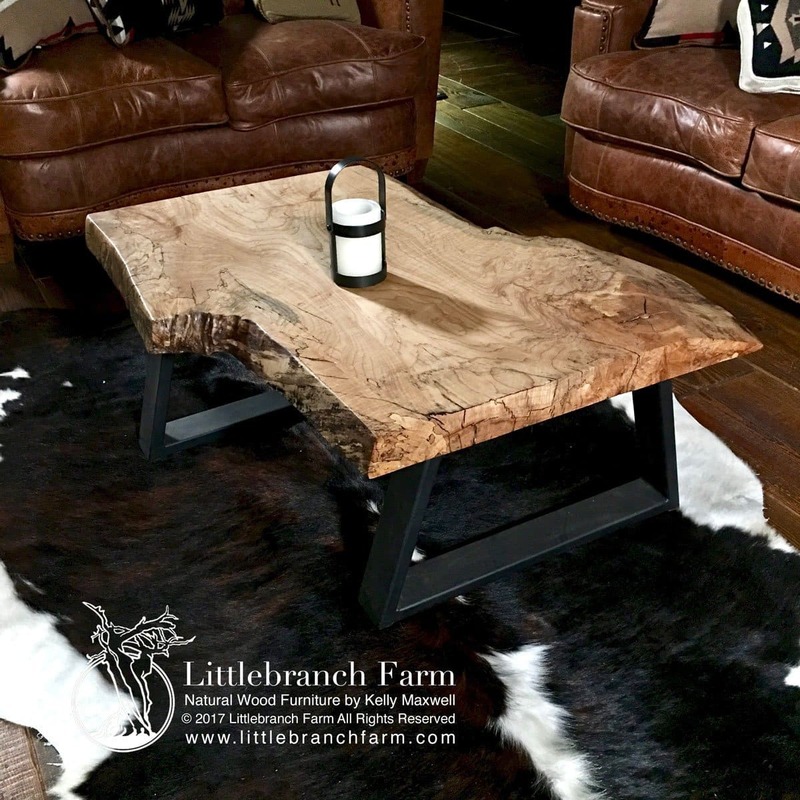 At Littlebranch we craft rustic elegance by finding the balance between nature and elegant wood furniture. We also have optional hand forged metal bases. We use our blacksmith to forge, pound and twist the metal to craft these bases. Because of the heating of the metal, each base will have a variance in color. In 2003 the live edge furniture series by custom furniture maker Kelly Maxwell started to form. It made perfect sense as tree slabs or live edge wood was readily available. 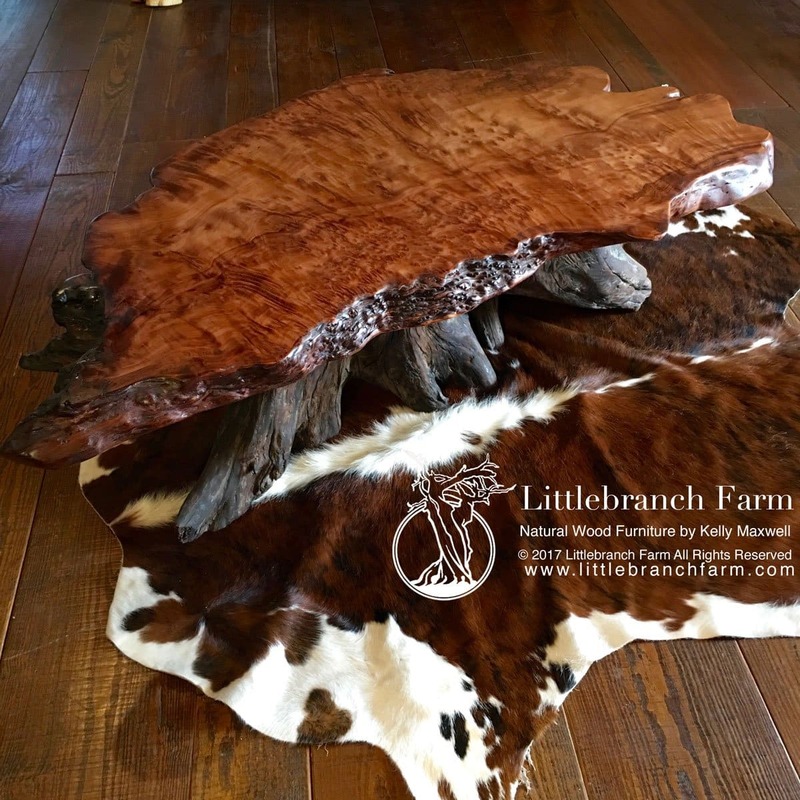 Our rustic style live edge furniture incorporates natural wood slabs. 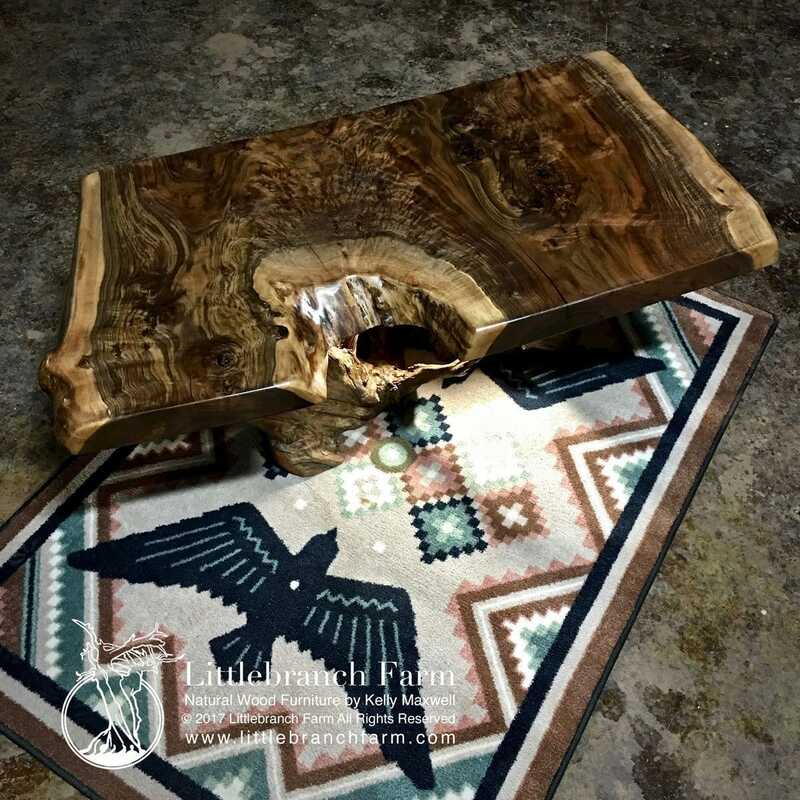 The live edge coffee table is apart of this design.